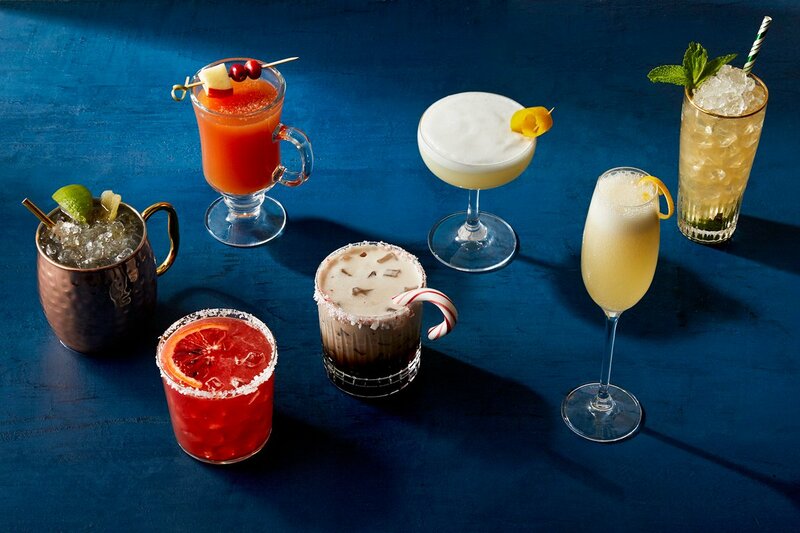 'Tis the season to... get your bar in the holiday spirit! From boozy classics to creative new concoctions, your guests can toast and get toasty with these festive cocktails from some of the top drink publications across the web. Think of it as our gift to you! Directions: Mix cinnamon and sugar, then pour onto a plate. Wet rims of each glass and dip them in the cinnamon-sugar mixture. In a cocktail shaker filled with ice, pour eggnog, vodka, Kahlua, molasses, and ginger. Shake to combine. Pour into glasses and top with whipped cream, then add a light drizzle of molasses. Directions: Shake ingredients without ice, then shake again with ice. Strain into a coupe glass and serve up with a salted rim. Directions: Shake sangria and cinnamon cordial over ice. Fill mason jar with ice, berries, pomegranate seeds and lemon slices. Pour sangria mixture into jar, top with Cava and garnish with cinnamon sticks and star anise. Directions: Shake all ingredients except hot tea together. Pour in Irish coffee mug. Garnish with lemon wheel. Recipe courtesy of Town and Country. Directions: Combine all ingredients in a copper mule cup over crushed ice, top with ginger beer, and garnish with lime wheels and star anise. Recipe courtesy of Absolut Elyx. Mint-Infused Vodka: Thoroughly wash mint leaves and place in a decanter or jar. Empty vodka into container and muddle slightly to release the essential oils. Store in a cool, dark place for at least 3 days - longer if you want a stronger taste. Directions: Combine all ingredients in a champagne flute. No need to stir, the bubbles will make sure everything mixes up enough. Top with Sugared Cranberries. Recipe courtesy of The Cookie Rookie. Directions: In a cocktail shaker filled with ice, combine cream of coconut, vanilla vodka and creme de cocoa. Shake until well chilled and combined. Strain into an ice filled glass. Recipe courtesy of The Marvelous Misadventures of a Foodie. Now that your bar is ready for the holidays with an updated menu, is it ready to invest in a strong venue management software? Just by using NightPro's advanced digital features – like reservation tracking, detailed reporting, and the ability to sell tickets and tables directly on your website – you'll help streamline operations for your entire staff, improve sales, and learn more about your guests than ever before. To get started with us or set up a free, 15-minute demo, fill out this quick form here or visit nightpro.co.